AutoCAD 2017의 새로운 기능 중 PDF를 가져올 수 있는 기능을 소개 합니다. 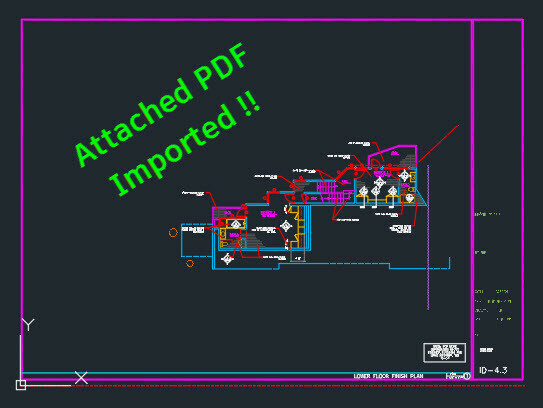 New in AutoCAD 2017 is the much-needed ability to import PDFs. This new feature will import geometry and True Type Fonts (.ttf) only. If your PDF file contains fonts that use an .shx font, that text will be imported as linework. But either way, this is by far my favorite new feature. 1) Importing a PDF by browsing to a file. 2) With a PDF already attached to the drawing (like an XREF) – Importing a portion of the PDF or the entire PDF. The Command to import a PDF is simply PDFIMPORT or the “PDF Import” button is found on the Insert tab > Import panel > Import Dropdown. Notice the command line that asks you to “Select the PDF Underlay or [File]”. Click on the “File” option. After you select the PDF, You will see the “Import PDF” dialog box. Make sure to check out the options in this dialog box. Something that I really like is that the line weights used in the PDF can be imported. The other great thing is that if the PDF was created using the option to create layers, those layers will be imported as well. When you click on the “Options…” button of the dialog box, it will open the normal AutoCAD “Options” dialog box. Here you can specify where the PDF Import should place any Images that are in the PDF. 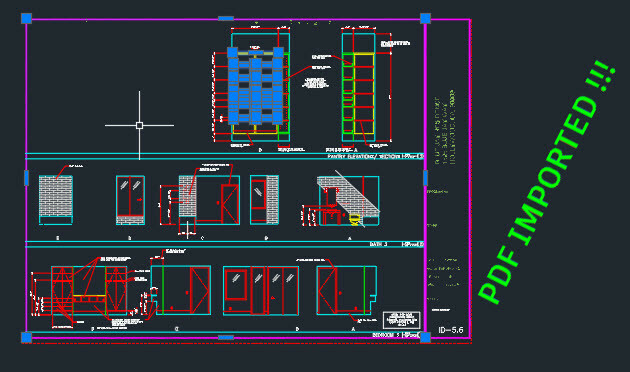 These images will be imported and attached to the drawing like an XREF. After you click the OK button back in the PDF Import dialog box, the progress bar will churn a little bit and then voila!!! 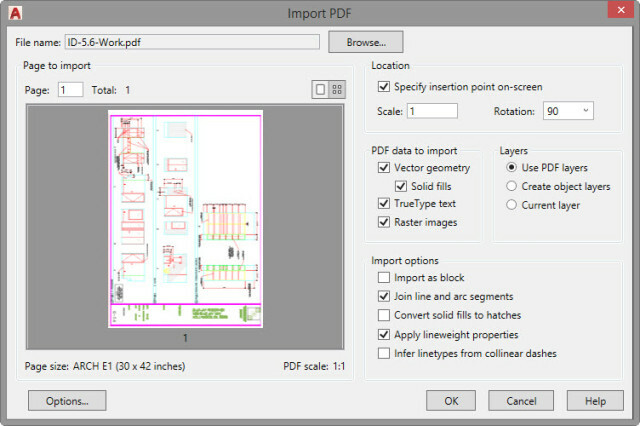 your PDF is now imported as editable AutoCAD geometry. You can use the PDFIMPORT command and button just like the above step. There is also a new button on the “PDF Underlay” Contextual ribbon that displays when you select the PDF that is currently in your drawing. When you start the command and select the PDF, you will see the options in the command line to select a portion of the PDF objects or All of the PDF. You will then need to specify what should be done with the attached PDF after the import is completed. The Settings dialog box looks different but has the same settings as the “Import PDF” considering the PDF is already in your file. When you click OK it will churn away and your PDF will be imported.